Bio: An ideator, leader, entrepreneur and consummate networker, Cole T. Evans is focused on rapidly growing start-ups that bring innovative products to businesses and consumers. As Founder & President of Kiss Industries LLC, his concentration is on building strategic partnerships and business development. The team at Kiss develops solutions for health and wellness, addressing the need for superior delivery methods that bypass the common ingestion approach. New to the market is CONFADENT Oral Technology, offering oral care between brushing. 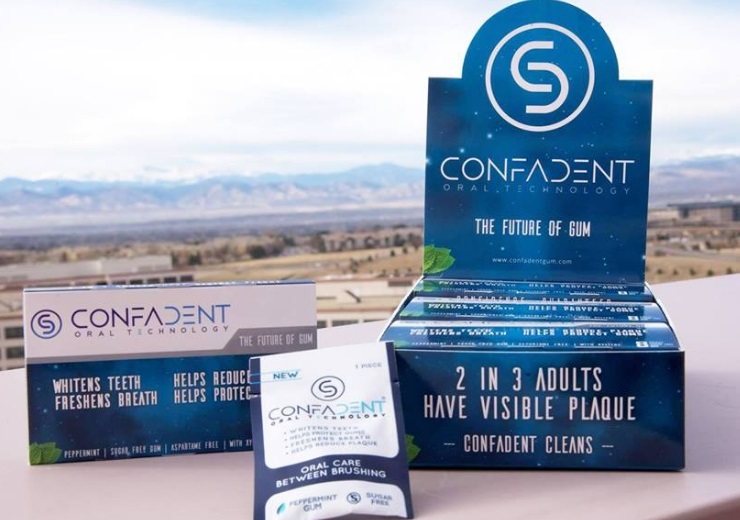 With FDA approved active ingredients, CONFADENT is the only healthy, convenient orally beneficial chewing gum that freshens breath, whitens teeth, reduces surface plaque, helps protect gums and fights harmful cavity-causing bacteria. It’s the Future of Gum. BUSINESS - I drive business development by networking and leveraging strategic relationships. My passion is for developing and sustaining meaningful connections. Negotiation is my strong suit, as in optimizing our COGS with our manufacturing partners; I concentrate on positive investor relationships. My mind is always searching for innovation in hard-good tangible products. I conduct research on a daily basis; examining our product, as well as others, and thinking about how can we make products even better. I strive to solve for how we can enhance product value and customer experience. Additionally, I spend a few hours each day researching and learning about successful innovators past and present. I like to dive deep into their minds to understand how they think about the big vision for their companies and read about what structure they put in place to keep their brands fresh and relevant. I take inspiration from great leaders like Kevin Plank and Tilman Fertitta and adapt my business behavior, shortening the ‘learning curve’ wherever I can. The best thing about myself is that I came into this world with a great deal of confidence. There’s a significant difference between healthy confidence and arrogance, and to me, confidence represents a high level of assurance in one’s own abilities. I believe that if you live comfortably within your own skin and always stay true to yourself (playing the cards that you were dealt), instead of constantly caring about what others think of you, you will be rewarded with meaningful relationships with the many people who surround you. I’m also a big believer in surrounding myself with other confident, highly motivated individuals who are on a mission to relentlessly advance their world forward. In correlation, I’m lucky to have developed my leadership skills at a young age. I was always the team soccer & flag football captain on the playground at recess. This forced me to constantly have to pick a new team each day, and adapt to that particular team’s talents and weaknesses. It was those 30-minute recess breaks in elementary/middle school that gave me the confidence and leadership skills which allowed me to succeed as all class president in high school & captain of my high school sport teams & NCAA sport teams in college. My company was launched while attending business school at Trinity University. This required a different set of leadership skills. Each day, I still employ my competitive athlete mentality, which allows me to foster collaboration and lead by example through hard work and determination. My business aspiration is to one day become an international industry icon. I would like to operate a company that employs thousands of people from across the globe and has a reputation of excellence and integrity everywhere. My goal is to travel and be involved in global business dealings in the public and private sectors. When I get to such a point in my life, I would like to become an adjunct professor for entrepreneurship at an accredited university. I’m a huge believer in laying out a very sturdy foundation for budding entrepreneurs by getting them started on the correct path, ensuring a higher chance for success in their future. From a personal standpoint, I’d like to eventually get married, start a family and be the type of father my dad has been to my siblings and me. .
There’s not a doubt in my mind that taking CONFADENT Oral Technology from a concept in high school, to a prototype in my dorm room during college, to a present day commercially sold product has been my biggest win so far. It was a lengthy and grueling process just to get to where we are today, and therefore I consider it a massive success. So many people’s concepts and prototypes are shelved and stored away before being given a chance at “real life”. I wasn’t going to let that happen with CONFADENT. The most difficult decision I’ve faced in my life thus far has been deciding whether or not to leave college before graduating. While I was still in school, I was forced to make the decision between paying attention and listening during classes, or operating my growing business. It’s not rocket science to figure out what decision I made. Surprisingly, I was also able to achieve reasonably high grades in each class by studying late into the night and during business downtimes. Even when I would get an A- or B+ on a challenging exam, I was never fully satisfied. After getting an exam or paper graded and handed back to me, I would constantly ask myself: Why does getting high marks matter if I already have a successful company and don’t need to be hired out of college? What does getting good grades prove to anyone about yourself? When I made the decision to not return to class in the fall of my junior year, it felt as if the entire city of Manhattan was lifted off of my back. Though dropping out of school was considered daunting and frowned upon by many individuals who surrounded me, I didn’t make my decision with any naysayer’s opinion in mind. Even though I knew I’d temporarily lose the respect and trust from several people around me, I had to pursue my dream for a chance to be very successful at a young age. My decision is paying off big time for my team and me, and as initially challenging as it was to pull the trigger on, I’m never going to look back in the rear view mirror. “Living The Dream” – To me, “Living The Dream” is much more than just a quote on a piece of paper. It’s truly a state of mind and a lifestyle choice. Put it this way – Don’t wake up each day and think that it’s just another day in your life; it’s not just another day, it’s the one, single day that’s been given to you. It’s a gift, and it’s the only gift that you have right now, and the only appropriate response to this gift is gratefulness. If you do nothing else in your life but cultivate that response to the great gift that this single, yet unique day brings, and if you learn to respond as if it were both the first day in your life and the very last day, then you will have spent this day very well. My business role model is Kevin Plank. Kevin is the Founder & CEO of Under Armour. From a young age, I knew that I wanted to study business entrepreneurship in college and this is greatly thanks to Kevin. I’ve always been a big advocate of his performance brand, Under Armour, and after getting the rare opportunity to meet and spend time with him, I am very captivated by his underdog (hard working) mentality and his passion for continuous innovation. He’s coined a few sayings that I have framed and I look at them each morning, when I’m mentally preparing myself to take on the busy day. My personal role model is my father. He is a successful entrepreneur who runs an incredible healthcare software company in Denver, Colorado. He has taught me more about life and its many wonders than anyone in my life today. My father and I play lots of golf together during the summer months and tear down the slopes together during the winter months. I would never pass over a single opportunity to hang out with my dad and learn from his many past experiences. He’s the man. My favorite warm travel destination is Tulum, Mexico. The miles upon miles of sandy-white beaches and big blue waves are absolutely incredible. I’ve yet to visit a beach town that makes better shrimp tacos & mojito’s than Tulum. My favorite cold travel destination is Ketchikan, Alaska. The salmon and halibut fishing off the coast in Ketchikan is by far the best fishing in the entire world. I get a better shoulder workout from reeling in giant fish in Ketchikan than I do when I bench press at the gym. My dream travel destination is Fiji. I’ve not yet had the opportunity to visit Fiji and I’ve set it as my personal goal to take a trip there after we sell our company in the next 3-5 years. It will be an incredible reward when that time comes. My favorite products consist of CONFADENT Oral Technology, Titleist Pro-V1x Golf Balls, Under Armour Drive One Golf Shoes, PRYSM Virtual Workplace, Chapstick and Mont Blac Bohème Bleu ballpoint pens. All of these products are produced by some of the world’s most technologically advanced machines, and they are made with extreme precision and care. It’s an eye opening experience to watch these items come to life on the production lines right in front of you. I am one of the most avid golfers you will ever meet. Just about any opportunity that allows me to head out to the links, I jump on it. I really enjoy playing competitive tournament golf and friendly gambling matches alike. To me, there’s not a bigger rush than standing over a 10-foot putt knowing that you must sink it to stay in the match. I live for those moments. During the snowy Colorado winter months, I love ripping down the slopes in Beaver Creek or Vail, Colorado. I am a big backcountry skier and I love skiing through deep powder and trees with my parents and brothers. Lastly, I am a sushi and craft beer enthusiast. There’s nothing better than a spicy tuna roll and a cold one during dinner time.